Mr O'Neill has told me and others on several occasions that I am personally bankrupt or unemployed or that the company that I own has gone broke or has no clients. I hoped it wasn't someone playing a cruel April Fool's joke when I saw this news in the Ottawa Citizen on April 1. 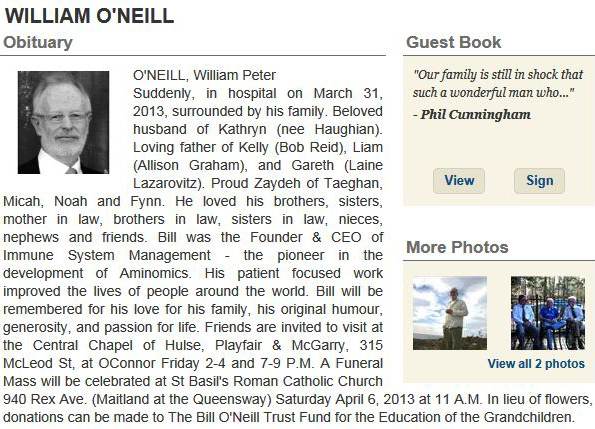 Yes, folks, the beloved William P O'Neill of the Canadian Cancer Research Group and its descendants has gone to the great cesspit in the sky, taking the Gutless Anonymous Liar with him. Sadly, he died quickly and not of cancer. 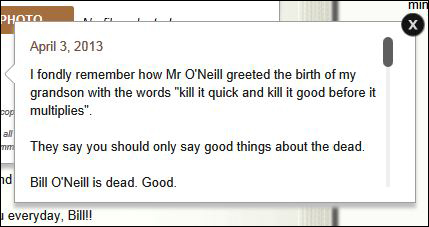 I posted a message to his memorial guest book, but unfortunately some technical glitch prevented it from being published. II will maintain my own memorial to him here by archiving his correspondence with me and also the wonderful messages he sent wearing his Gutless Anonymous Liar mask. It would be a tragedy for this valuable collection of literature to disappear.